On certain nights there are nightmares, dull, blinding and dramatic. Every time the scene is the same, I run down the Sukleshwar ghat on the banks of the Bramhaputra and scream at the waters facing Umananda, I am angry that the waters have killed yet again, angry that its spate carries thousands of innocent heads and yet it stares back at me, dull, deathly, as if in great peace. Bhupen Hazarika’s song, ‘Bistirna paarore axonkhya jonre hahakar xuniu nixobde nirobe Burha luit tumi Burha luit buwa kiyo?’( How can you keep on flowing O Bramhaputra in spite of hearing the desperate cries of numerous men& women) haunts me for long, till sleep is a thing of the distance past. I go back to a conversation between a man and a woman, a woman who has escaped captivity and in being reunited with her lover talks of a strange and dry river. And then I recollect the Loire.. Most of our understanding of culture and roots, take us back to the notion of home, the notion of things tangible or not, that represent who we are in the end. The idea of what we know now as home and the thread that makes it so, is often different from how one might have imagined it to be, say even fifty years ago. Not because homes, feelings or the lands have changed but because we have become translated creatures, irreversible in our contours, different from how we were conceived, loved and moulded. While our understanding of what home, its fragrance and notions are continuously challenged in a world that is irreversibly blurred, there are a few constants still remaining that perhaps compel us to tread that path, look back, smell and smile at the strings that were. And while our notion of a childhood home or love for it, might actually constitute of elements that are rather vague, we’re often clear about the dots that join this trajectory of a much trodden path. My image of home thus runs through a parallel formed from rivers, dighis and more, through which I seem to have touched that land in ways minute and long. The songs and the stories I have heard spun around them like that invisible gossamer thread that binds a fine weave. Like my father’s or his father’s before, I cannot pin point at what particular time in period such water bodies touched or sought home in me, but like all beautiful things, the waft remains. My father’s remembers his Dighi in what was home once in Sylhet, now in Bangladesh. A water body that was part of the house that they lived in, where the fish would breed, where villagers from near and far would come to enjoy the fish or spend numerous hours idling. That home is no more, the waters too perhaps, but memory and childhood stories are strange creatures, they cling and make a pattern out of almost nothing. In the same pattern I have fashioned home after many such water bodies that I have touched and which in turn have touched my life making fascinating inroads into it like a cartographer designing maps from memory. It is almost sixteen years now since I have left Assam, the land where I was born, and yet memory is fascinating. In nightmares as in happiness, I am taken back to a river that glides through my mind. When my husband, soon after our marriage asked me to describe the Bramhaputra, I did as if it was a lover, many years later standing beside the same river he calls me to say that the river is in indeed beautiful, perhaps more than I had described it to be. I think then, that somehow every river you might have loved becomes a part of you and over the years in your memory, it assumes a cultural construct difficult to take away, by any other description but that which has remained with you. Most of us today live in a multilingual environment where we switch modes automatically driven as if by some innate force not to remember. This self-construction is of course useful for those who cross borders and retain only a whiff of that beautiful memory and yet the river, it remains. In fact such is the force of history and childhood tales, that as children of homes both imaginary and real we return to the river as the only solace, where nightmares turn peaceful. You wonder then if you’ve build that bridge which takes you to the other side of memory, where the happy and the traumatic co-exist. But not all rivers are about memories; there are waters that spell more, sometimes less and leave us wondering about the proportions that it might assume in our lives. And so it was, on one particularly dull evening when a friend from deep in the villages of Karnataka wrote to me about the loneliness of being by the Kaveri. ‘Far away from civilization, shops and humanity, the river is a lonely place to be.’ ‘But there is a song to every river’ I wrote back and told her the story of Dihing. The National Highway 38 is dotted with fruit trees. Driving down this road that originates near Makum you come across little townships and villages with lyrically pronounced names. Digboi, Margherita, Borgolai, Ledo, Jagun, Lekhapani all of these seem to straddle little streams that connect you to some undiscovered plot. The ingenuity of planting fruit trees all along the road, strikes you. Jamun, Jackfruit, Mango, Jalpai-The Indian Olive, dot almost the entire highway and on a summer day you might see little children hanging from these trees, bring down the fruits, enjoying some and selling the rest to the curious traveler. As you travel further deep into the land, the scenario often changes, sloping hills filled with tea plantations often give way to paddy fields, somehow connected to little streams. Small boys standby near these paddy fields on the adjoining highway and sell fresh fish straight from these streams. ‘Baideo pabho mas lobo neki?’ (Sister will you take some Pabda fish) you are asked. You wonder then, if you could actually smell the fresh waters close by and whether you might see one peeping around the next corner, but then rivers are secretive in their youth, gurgling and happy and often hidden. You have to travel to meet them. One such river that flows languid and lazy in its pace between tea gardens and little hillocks, is the Dihing or Burhi Dihing as it is called. One of the largest tributaries of the Bramhaputra, I happily assume that it originates in my backyard in a story that takes me back to when I was a little girl. As a twelve year old living in a largish house facing the Patkai ranges, in small town Digboi I was extremely worried that a little stream that has marked its way on the grass just below the hill, had yet to take off and become that gurgling stream, I knew it has the potential to become. I remember standing on the red tiles of my verandah while watching the Patkai suddenly turn white. Surprise and hurt filled my vision as the dear hills became invisible. The winds sounded crazy that afternoon, the Eucalyptus shorn of its bark and the lemon tree just beneath it danced like there was no tomorrow. As I watched, the forests were enveloped in the same white mist and even as my frantic eyes searched for the mountain and its beauty, the smell of rain washed over me like a hurried spray from somewhere set in distant time. And then they were there the rains, beautiful and majestic in huge drops that created a din on my sloped tin roof. As I stood drenched in the water that afternoon, bit by bit the land came alive, the haze lifted, the frogs croaked and my little stream filled with songs. Dihing had been born there I was convinced, somewhere down a twelve year old’s memory lane, that afternoon. I had drawn a pencil sketch to commemorate that day, and named it Buhri Dihing. My daughter’s sense of Geography tells her that all the rivers in the world are joined to each other, much like our thoughts I think, from childhood to adulthood and thereon. How the little stream barely a trickle, turned into Buhri Dihing is probably less a geographical phenomenon and more a child’s fertile imagination that would have one believe in such a story. But then Buhri Dihing came back to me in other forms, in stories carried by an uncle. Working in the tea garden, he would visit us often and the quiet and curious listener that I was, he regaled me with strange stories of rivers, tigers, demons and fairies all of which I took in like a silent spider weaving its web in invisible silent magic. Serene and tucked away as it were, with lazy white small beaches, the Dihing overlooks the woods near small town Margherita. Set amidst these woods was the house of an uncle and so it was that one such afternoon I sat beside the Dihing, as it flowed green and garrulous. As if not pleased by the description, further downstream she turned grey and muddy like a stubborn child, with a sour voice and a glum song greeting you. I wondered then whether my grey skirt reflected the mundane silence of the river, and then all of a sudden I heard the soft flutter of wings in the impending dark. Below the little white rocks, swift fish tailed movements stirred. I raised my neck and strange eerie like, felt the presence of a little white owl that had decided to share an evening with me. For a while, the river stopped, the leopard prowling somewhere, stopped too, I looked up and somehow become a part of eternity. Memories of home and its rivers remain fresh, often blue in colour, transcending borders and the narrow confines of language. It stands out like the songs of childhood, its fragrance forever fresh. 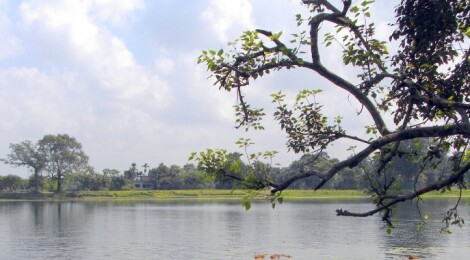 * Dighi is a term in Bangla that refers to a largish lake. Here it has been used to denote a water body.